I love windows. I love natural lighting, and seeing the sun stream into a room mid-day. Not going to lie, I think I might be part cat, in that I'm a little obsessed with taking naps in those sun-spots. But regardless, I love windows, and I have a tendency to love houses with lots of windows. I also love having privacy. I get entirely freaked out at the thought of people seeing into my house at night. So curtains, particularly thick curtains that open and close easily, are important to me. But curtains, particularly thick, light-blocking ones, are expensive. So I've spent the last 8 months researching every budget and DIY curtain possibility in an attempt to cover the 15 windows in the front of my house as economically as possible. Multiple times in this process, I wished a magic curtain fairy would pop out of the ceiling and just give me the perfect solution. That never happened. But at this point, I've researched every possible budget curtain possibility, and tried about half of them. I have so much useless curtain knowledge that maybe, just maybe, I can be your magic curtain fairy. At the very least, I can lay out all your options in one nice post, and let you pick from there. A couple things about my curtain philosophy (because, yes, at this point I have one.) Curtains should be 1) thick, because privacy is a must; 2) easily operable, because I have better things to do than spend 10 minutes each morning and night drawing the drapes; 3) long, because all the interior designers in the world say curtains should be hung high and wide, and I believe them; and 4) affordable. All my curtain suggestions and opinions are geared at achieving these four points, so keep that in mind! I feel there are three parts to a curtain system: the primary fabric (what you see), the lining, and the accessories (rod, rings, etc.) I address the options for each of these separately. If you find some really unique fabric and have solid sewing skills, making your own curtains from by-the-yard fabric is definitely a possibility. But, unfortunately, it's probably not a budget possibility, at least, not compared to store-bought curtains already on the market. So, for the record, I tried this option. I purchased six drop cloths from Harbor Freight to make into curtains. I had beautiful visions of flowing white curtains in my sunroom. It was an unmitigated disaster. I actually wrote a whole post on why dropcloths make terrible curtains, aka, everything that went wrong in my attempt. I encourage you to go take a look if you're considering using dropcloths. If not, and a quick summary will do: dropcloths don't reliably bleach white, and they shrink significantly in the wash.
That being said, if you're fine with a cream-color, and don't intend to ever wash the curtains, they could work. They definitely qualify as budget, so that's a major plus! If you've spent anytime on Pinterest (or, alternatively, the super sketchy neighborhood I used to live in) you know sheets as curtains is a big thing. I actually tried this option with some success in my sunroom, after the great dropcloth failure. As you're probably aware, sheets are thin, and if you want any privacy whatsoever, you're going to need a thick liner. But they can look nice at a pretty cheap price (see above photo.) The caveat here: they look nice when all bunched up. If you have any plans to draw your curtains at night, be aware that they are still sheets. When all stretched out across the rod, they look like sheets, because that's what they are. Not necessarily a bad thing, but yes, any guests you have will be able to identify them as sheets. 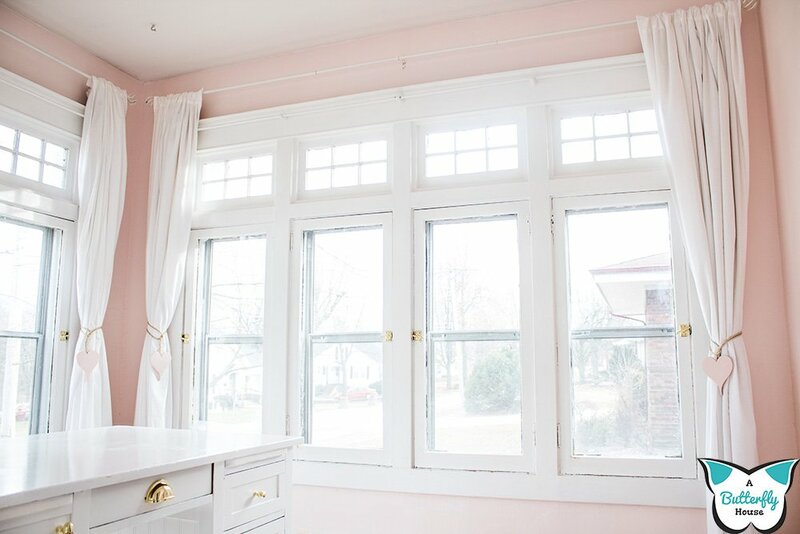 This is my very favorite option, because your curtains actually look like (spoiler alert!) curtains! Because they are curtains. The downside? It's really difficult to find long curtains off the shelf. Most budget curtains come in 84 or 96 inch lengths, which if you have 9 or 10 foot ceilings, is just not long enough. The only budget retailer that has a large selection of 100+ inch curtains at less than $20 a panel is Ikea. It is my personal belief that all curtains that are intended to provide privacy should be lined. And while there are definitely budget lined curtain options on the market, they don't tend to come in extra long lengths. As a result I've found myself adding lining to curtains whether I DIY-ed the primary fabric or not. Almost any fabric could work as a lining but these are the three I've found that are readily available and budget friendly. One other general thought: Curtain liners don't need to be as long as the curtains themselves. As long as the liner fully covers your window, nobody will be able to tell if the liners are a little too short (especially if you use my method for lining curtains.) Thus, dropcloths are a much better option here, and twin sized flat sheets can be used instead of queen. Pros: Heavyweight and provide significant privacy, but still let light in the room. Cons: Discolor light/white curtains when stretched across rod. Cost: $8-ish dollars a panel, depending on brand purchased. I know I didn't give dropcloths the best review up in the "primary curtain fabric" section, but I actually think they shine as curtain lining. Thick enough to provide privacy, but not totally light-blocking, they're a really great budget liner for exposed rooms where privacy at night is an issue, but blackout fabric isn't necessary. The fabric is easy to work with, and unlike stiff blackout lining, is still soft and flowy. The only downside, as I discovered with my sunroom curtains, is that if your primary fabric is white and lightweight, the creamy dropcloth color shines through if the curtains are closed during the day. This mean your nice white curtains take on a creamy look. 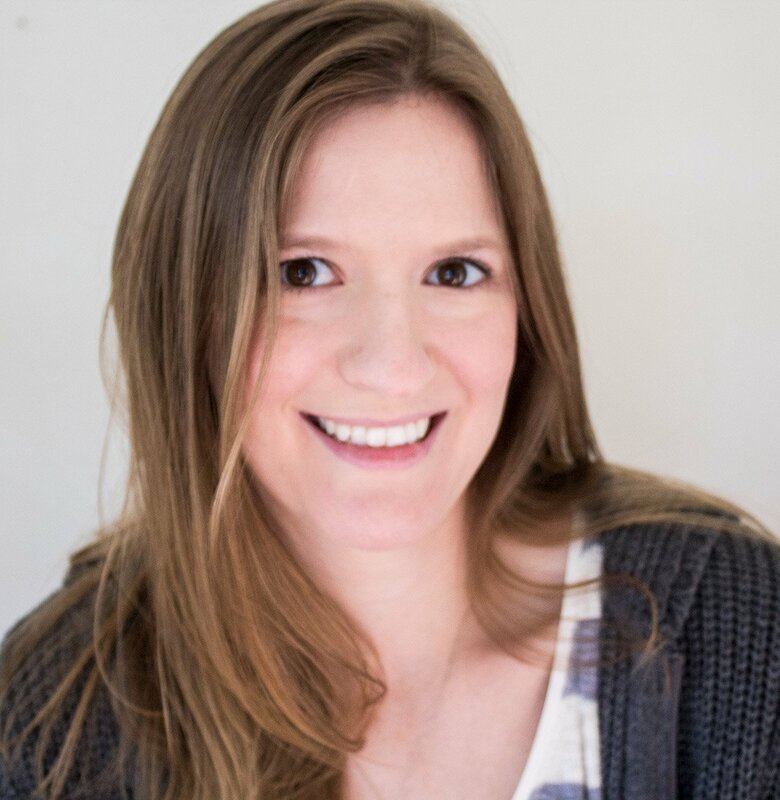 This isn't an issue when bunched to the side, or at night when the sun isn't shining, but it's something to keep in mind if your primary fabric is white and you anticipate keeping the curtains closed most of the time. So, I haven't actually used sheets as a liner, because frankly, they're just not thick enough for me in pretty much any capacity. But, I think they'd be great for someone who really only needs lightweight lining on their curtains. Pros: More choices like blackout and insulating fabrics. I use actual lining fabric for one specific location: bedrooms. Blackout lining gives me peace of mind that nobody is creeping on me as I sleep at night. Some people also appreciate that the sun is blocked in the morning; as someone who loves waking up to a sunny bedroom, that is not me. Regardless, store-bought lining is perfect for when you have a specific purpose for your lining to play, whether that be blacking out the sun, or insulating the windows. It is, however, more expensive than the other budget options. 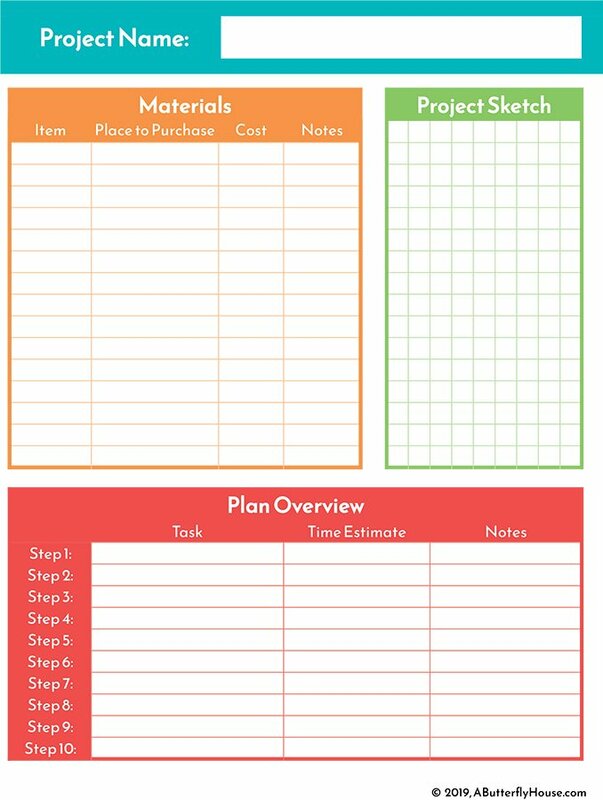 I typically spend so much time thinking about how to minimize the cost of my curtains that I frequently forget about the other pieces that go along with curtains... until it comes time to buy them. And them I'm sad, because curtain rods are frequently $30+, and curtain rings are $6-ish a pack at their cheapest. And suddenly, I find myself paying more for the rods and rings than I did the curtains! 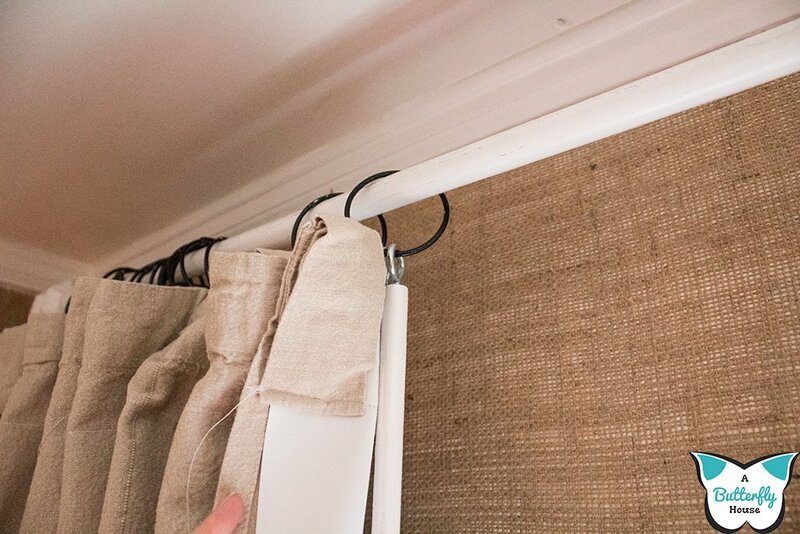 I've found a couple ways around this that I'm about to share, but before I do, I should mention that the second thing I keep in mind when buying curtain accessories is the ease of operation. I want to spend less than five seconds opening and closing my drapes. Anything that slows down this process is a reason for me not to buy that product. Longer curtain rods typically have 3-4 support brackets holding up the rod. Try to find a curtain rod that only has 3; Four brackets hinders your ability to fully close the curtains, since the two middle brackets will form a section in the middle that is inaccessible from curtains placed on the outside. Medium-long store-bought brackets typically have three pieces; two larger end pieces, and a smaller piece in the middle that allows for customizing the size length. However, this causes a bump in the rod. This bump can be difficult to move over, and cause your curtain to get stuck. The issue is unavoidable if purchasing a curtain rod off the rack, and might be a reason to DIY your curtain rod. 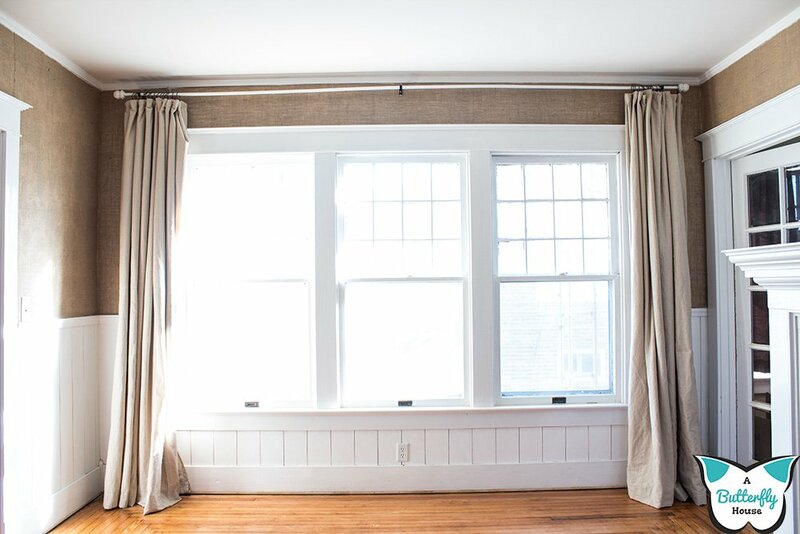 If you have lots of windows to cover, curtain rods can be purchased in bulk, and could reduce your overall cost. Maybe $6 for a pack of curtain rings doesn't seem so bad. But when I was initially planning my sun and living rooms, I realized that to hang curtains in both these rooms, I would need 12 packs of curtain rings. That's $72 in curtain rings. I have better things to spend $72 dollars on, so I came up with an alternative: Binder Rings. A 50 pack of 2-inch binder rings cost me less than $10 on Amazon. After spray painting, they're indistinguishable from traditional curtain rings. Some drapery pins from the craft store are all it takes to attach curtains to the rings. Much cheaper than purchasing traditional curtain rings. Admittedly, if you purchase curtains with tabs or grommets, curtain rings are unnecessary. But fabric tabs make it harder to open and close the drapes, which as I've mentioned, is a deal-breaker for me. Okay, I'll be dead honest, no one needs one of these. A drapery wand is that rod thing found in a hotel to open and close the curtains. I'm not sure I've ever seen one in a residential home. But, since I'm a fan of easily operated curtains and drapes, I wanted one. And, after a quick Amazon search, I found I could get a two-pack for 20-ish dollars. But considering a drapery wand is little more than a two buck dowel rod, I decided to make one instead, for less than $5 a wand. Go check it out, if you too are obsessed with owning easily-opened drapes. 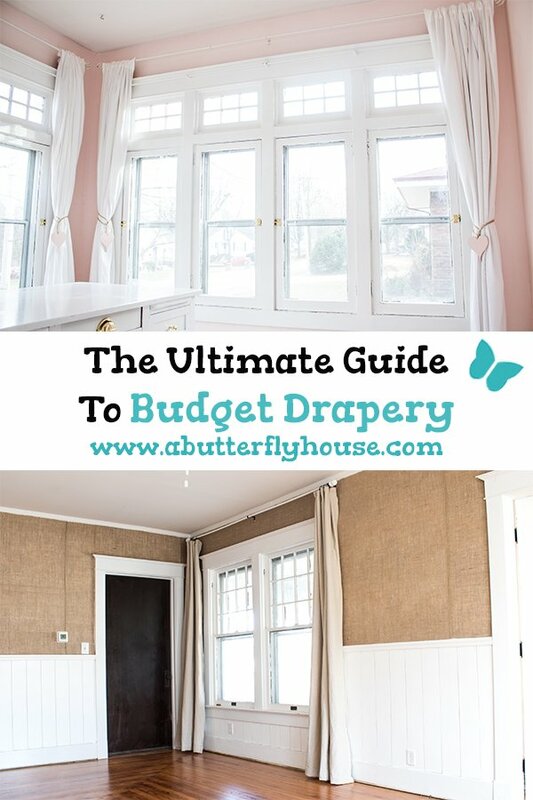 Despite all of the above information, I can't say I've settled on a favorite budget curtain method that I use in all the rooms of my home, which I suppose makes sense since each room has different needs. If you've tried any of the above, let me know how it went in the comments; I'd love to hear what did or didn't work for you! And if you found this post helpful, go ahead and save it to Pinterest so it's easy to reference next time you're curtain shopping!